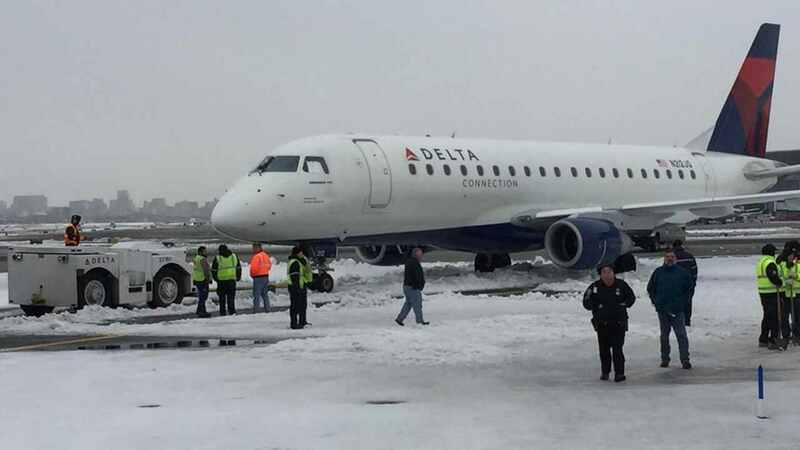 JAMAICA, Queens (WABC) -- A Delta flight landed safely on a LaGuardia runway Saturday morning, but then ran into a snowbank. According to Port Authority spokesman Steve Coleman, around 11:25 a.m., Delta Flight 5964 from Chicago to LaGuardia landed on runway 4-22. The pilot then turned off the runway to the taxiway, but failed to negotiate a turn and ran into a snowbank, he said. The plane, which according to the Federal Aviation Administration was an Embraer 175 regional jet, used its own power to get back to the terminal where the passengers were off-loaded after about 30 minutes. Delta spokeswoman Elizabeth Wolf said the plane was operated by Delta Connection carrier Republic Airline. The plane "encountered a depth of snow on the taxiway after making a normal landing at New York-LGA on Saturday. The ground crew quickly assisted in clearing the snow, and the aircraft then taxied to the gate on its own power." One runway was shut down briefly, Coleman said, but there were few interruptions to flight operations.